The Lacons® 150750 is manufactured in The USA with laboratory grade polypropylene. 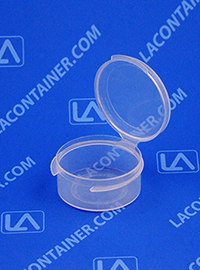 This small hinged-lid plastic medical container is an ideal solution to organize university science experiments as well as eyepiece storage for microscopes or telescopes among other uses. Our Lacons series are also produced with the highest quality Class VI USP Medical Grade Polypropylene which allows for Autoclave Sterilization in the presence of Aqueous Solutions. Certifications, Regulatory Data Sheets, MSDS, and Drug Master File assistance is available upon request as we ensure and guarantee strict Material Lot Number traceability with each plastic container we produce. 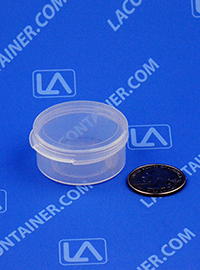 Lacons containers in smaller quantities. 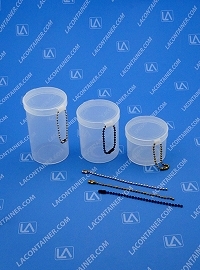 esdplasticcontainers.com now has a huge selection of lacons containers with no minimums. 1.40" Dia. X 0.64" Ht. 40.13mm Dia. X 6.86mm Ht. 35.56mm Dia. X 16.26mm Ht.